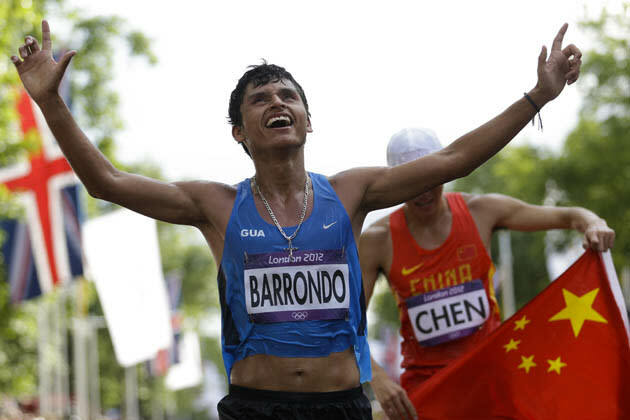 Erick Barrondo won Guatemala's first-ever Olympic medal on Saturday with a silver in the 20 km race walk (12.4 miles). He switched to the sport after sustaining a knee injury running. Barrondo used the opportunity to plead for an end to violence in his country. "It is well known that Guatemala has problems with guns and knives," said Barrondo. "I hope that this medal inspires the kids at home to put down guns and knives and pick up a pair of trainers instead. If they do that, I will be the happiest guy in the world." Barrondo received a call of congratulations from Guatemalan president Otto Perez Molina, who informed Barrondo that Guatemalans took to the streets to cheer his win. Now that Barrondo is a star in his country, he used his platform to encourage an end to violence. There's not a much better way for an Olympian to behave.